Being mums we all need some time out for ourselves and having some pamper time is something all mothers should take out for themselves once a week. Even if its an hour or 45 minutes all mums should make take time to feel good and to feel normal again. So when we came across RYS Hair & Beauty you can imagine our excitement. Its the ultimate one stop shop for all your beauty needs, from a blow dry, to manicure, eye brow threading, facials, you name it. 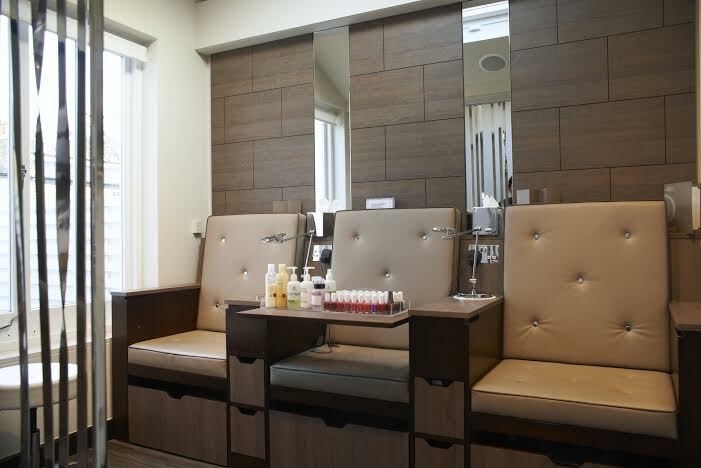 You can enjoy your treatment with a coffee, and even food. Enjoy a moment in beauty heaven. RM: Can you tell us a bit about the people behind RYS? 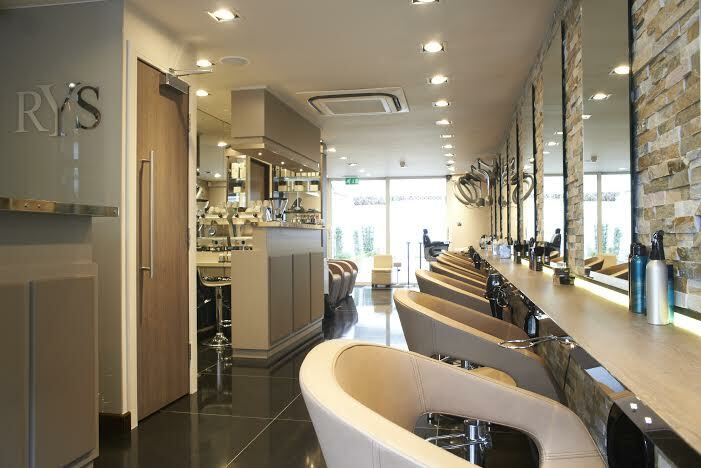 RYS: RYS hair and beauty’s founding members, Yilmaz and Reshma established this business after seeing a gap in the industry for quality of professional service and customer care. Yilmaz’s career in the hair and beauty industry spans over 18 years, and his clientele lists range from celebrities and royalties to his never ending list of regular customers, due to his meticulous hair cutting and grooming skills, paying attention to every detail, which also reflects in his persona. His famous hot thermal scissor cut now has become his trademark. Reshma’s career started in the Fashion Industry and later trained as a yoga teacher. Being a frequent seasoned traveller, exposed to excellent customer service in world renowned hotels and resorts, she felt that RYS would be a great platform to bring hair and beauty along with other concierge related services all under one roof for customers comfort and enjoyment. RM: Your a one stop beauty shop, can you tell us a bit about your favourite service? RYS: Our popular treatments range from our bespoke ‘RYS’ spa mist treatments, which is a great hair and scalp facial and clients see results instantly. Our new RYS colour bar has been a great hit with our younger generation of clients who have full head of highlights from £100 and tints from £50. RM: We totally love your our door hair saloon. What inspired you to have an outdoor area?. Can you recommend your favourite breakfast meal and smoothie? 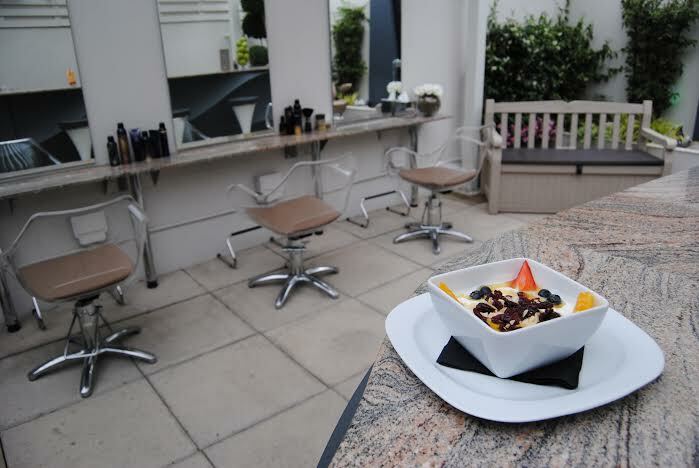 As the property had a garden, Yilmaz and Reshma wanted the clients to enjoy having their hair and beauty treatments “al fresco” style. The outdoor juice and champagne bar was created to give customers the ultimate in pampering themselves in style over a glass of champagne or wine, and if arriving in time for breakfast, over a bowl of our classic ‘RYS’ breakfast yoghurt with fresh fruits and granola and our famous cereal smoothie or choose from a range of healthy fresh fruit and vegetable juices. 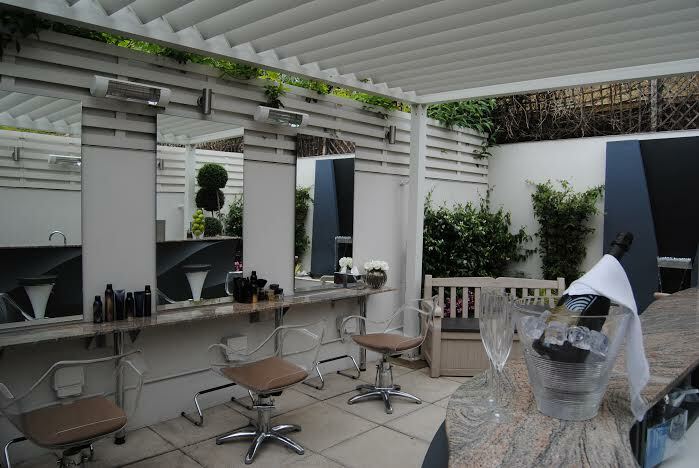 From hair services to reflexology, manicures/pedicures, “Indian” head massages and threading, RYS garden provides a very relaxing surrounding, very hard to find in the heart of Knightsbridge. RM: What treatment could you recommend for hair to restore your hair? RYS: RYS’s bespoke signature Spa mist treatments using ultra sound mist repairs and rejuvenates the scalp and hair, restoring shine, and gloss to hair that is colour treated and pollution exposed. RM: Can you tell us any exciting plans for RYS Hair and beauty? RYS: RYS plans to expand its wings to other locations in London and overseas in the future, and open its own hair and beauty training institute.